You Marched & Lives were saved! Virginia March for Life: Yesterday was a powerful day as close to 7,000 people descended upon the Capitol marching for the sanctity of every human life. 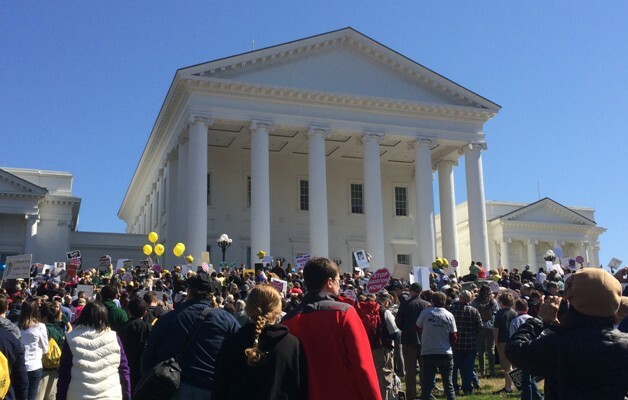 The first annual Virginia March for Life was a huge success, with Virginians from around the state of all ages coming together to fight for life on a blessed beautiful spring day. Thank you to everyone who came and witnessed to the truth. Our elected officials heard you loud and clear! Pro-Life Victory: While thousands marched for life just outside the Capitol, legislators convened inside for their "veto session" to consider the Governor's vetoes and proposed amendments to bills. In one of his proposed amendments, the Governor had attempted to undo the new restrictions against abortion funding that the General Assembly had adopted in February. But his attempt failed 50-45 in the House yesterday. The state budget bill therefore goes back to the Governor’s desk with the essential Hyde Amendment restrictions against abortion funding fully intact. A fitting end to an amazing day! There will be many ways you can become involved in the coming year as the 2020 Virginia General Assembly session approaches. Your voice matters! Please urge people to visit www.vacatholic.org and sign up for our advocacy network.